Stylist Michelle Crawford (@michellecrawford) runs us through creating the ultimate Instagramable platter imaginable. 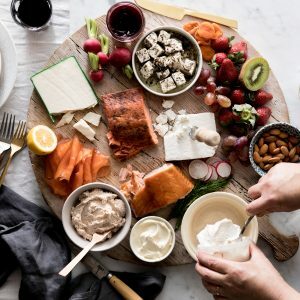 1 – Choosing your platter – Go big or go home! You want big impact, so think big when it comes to the size of your platter. Time to ditch those tiny boards! A marble platter or timber board always looks good and generally aren’t shiny, important if you’re photographing! 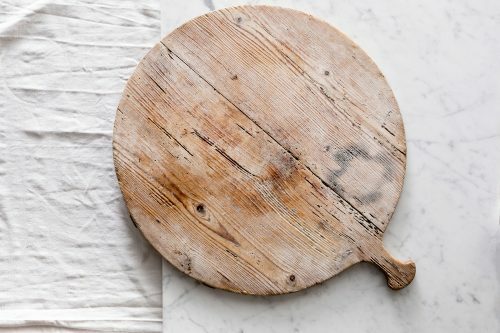 Round platters look better than square and opt for vintage or worn timber that will give instant texture and warmth to your platter. Secret stylist platter hack – If you don’t have a timber board just line a plain ceramic plate with baking paper or brown paper and add a few layers roughly over each other to add a textural look. 2 – Picking your hero ingredients! Forget sad little triangle bits of cheese! Choose one hero soft cheese wheel and a big chunky slice of blue vein. 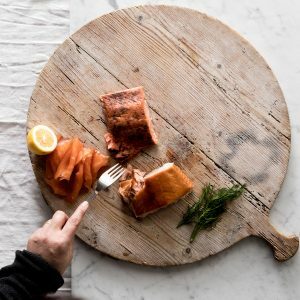 Then select a big portion of Huon wood roasted salmon together with your favourite cold smoked or cured Huon salmon such as their Whisky Cured Salmon. Huon Salmon or Trout Pate is also a good addition and always a favourite with the kids. Now for contrast! Colour – think fresh cherries, blueberries or strawberries which are all in season now! For greenery, a few sharp tangy pickles are always welcome as well as olives and beautiful kiwi fruit. Bold structural fruits like figs or radishes all add colour texture and flavour. Don’t forget the nuts, walnuts, almonds or hazelnuts too. Then choose a selection of crackers or bread sticks. Place your hero pieces in the centre first. Cold smoked or Cured Huon Salmon, piled loosely into ribbons so people can easily grab a slice. Then the Huon Wood Roasted Salmon, this will start to give your platter structure. 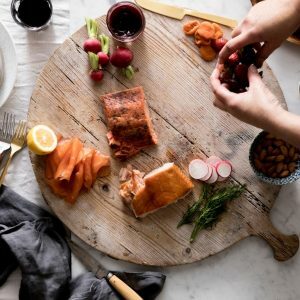 Tip: use your fork and just flake the end of the wood roasted Huon Salmon portion – then none of your guests will feel like they’re the first to break the perfect portion! Then add the cheese, pate’s, gherkins and olives. Oh, and don’t plonk those plastic containers on your platter! Decant any pates or olives into small (nice!) bowls, or even a thick smear of the pate or a soft cream cheese directly on the board looks good too. Place the small bowls around the platter. Try to avoid placing them too symmetrically, we’re going for a rustic ‘whatever’ feel here. Finally, fill in the gaps. Use nuts and fruit directly on the platter, and keep them together in drifts. Don’t randomly dot them all over the platter. Think a big pile of cherries in one section, and walnuts in the other. Create piles directly on the board rather than using to many little bowls. 4 – The final touches! 5 – After all that effort you’re gonna wanna snap it! Huon Now, this tip Michelle is about to give you Is going to change your life. And once you read this and the lightbulb goes off, you’ll never do it any other way! Put your platter on the ground. Yes, you read that right. If you don’t have timber or concrete floors, just lay a plain sheet or picnic blanket on it first and then place the platter down. 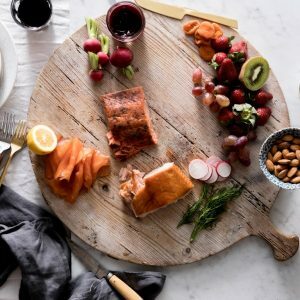 No more standing on chairs at your dining table to get the perfect flatlay! 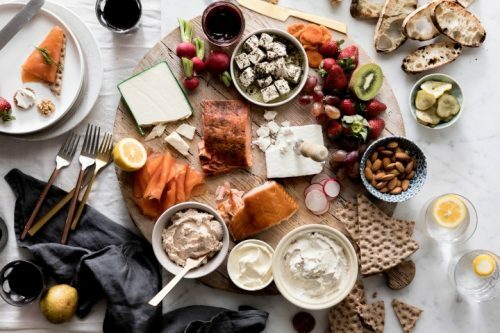 To take your photo, place your platter in some natural light, not direct sunlight, either near a window or glass door or outside in a shady spot, maybe on a picnic blanket- but avoid harsh lighting. A flatlay is always going to work best, so hold your phone directly above the platter, keep it horizontal and snap away. A few hands reaching to take a piece from the platter always adds an appealing human element.